This is a big question – and one that can have an expensive price tag. What factors should you consider? The experts tell us that graduate school brings benefits – those having earned advanced degrees tend to earn bigger paychecks and promotions than those who only have an undergraduate degree. For example, if I have a master’s degree, on average I earn $200 more a week than someone with a bachelor’s degree, or about 15% higher overall income. Over a lifetime, according to the U.S. Census Bureau, a person with a master’s degree may earn $400,000 more than one with only a bachelor’s degree. This is a reflection of improved skill sets, job-related competencies, knowledge base, marketability, and earning potential based on the significantly improved value of the holder to the organization. However, while earning a master’s degree could increase your chances of earning a promotion or finding a higher paid job, an upfront investment is needed. 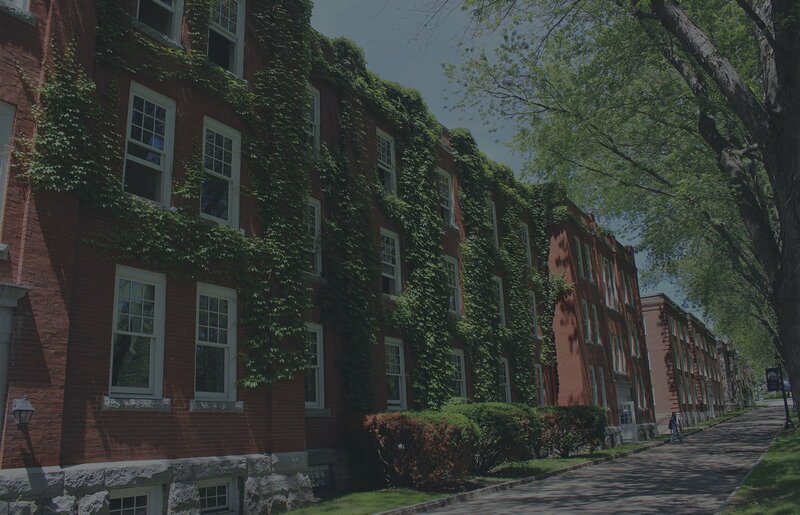 According to FinAid.org, the average cost of a master’s degree is between $30,000 and $120,000 depending on university and area of study. Attitudes about master’s degrees have changed significantly since the 1970s when they were often considered simply a consolation prize for students not able to complete their doctoral degrees. Since then, master’s degree has evolved into an important professional credential highly valued by most employers. According to Burning Glass Technologies, graduate degrees are required or preferred in more than 20% of the positions available in the U.S. job market. Increasingly, the professional world values the growing number of managerial positions that require digital skills versus the ones that do not. The Education Advisory Board, in their 2014 custom research brief, Development of Online Master’s Degree in Higher Education Programs, found that nationally, “demand for graduates with skills gained from a master’s degree in higher education increased 54 percent nationally from January 2010 to June 2013.” Additionally, the Board found that metropolitan areas such as around Boston, MA and Washington, DC, reflected some of the highest demand for graduates with a master’s degree. Connecting the dots strongly suggests that earning a nonprofit management graduate degree prepares and positions the human services professional to stay competitive in the job market. 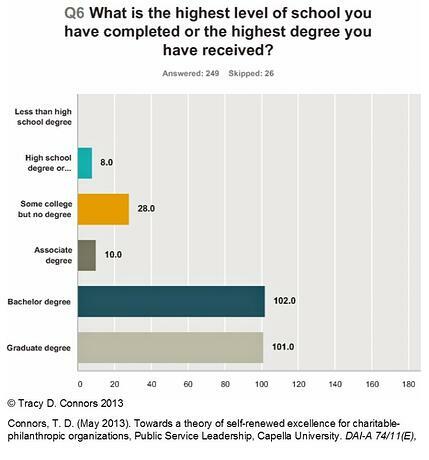 In a 2013 national survey and study1 determined that most NPO (nonprofit organization) senior executives have either a bachelor's or master's degree. However, few of the hundreds of respondents, all of whom were self-selected/reported as C-PO executives, held degrees in nonprofit organization management or related fields. Over 70% reported degrees from other fields. 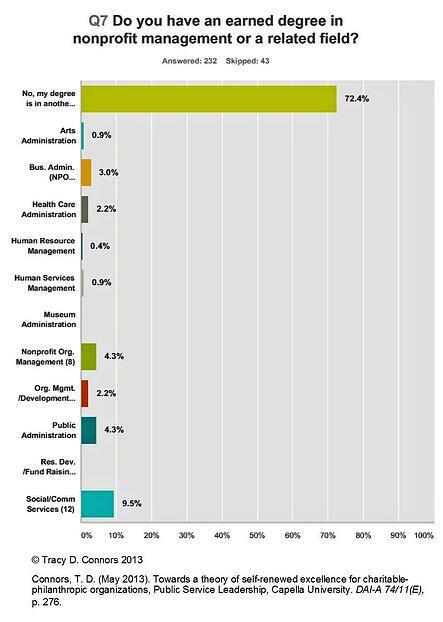 The next largest source was from the field of social/community services. This may reflect a pattern of internal promotion for social services agencies whose executives perhaps started as hands-on providers of client services. The majority of the respondents (60.4%) had not earned professional credentials beyond their college bachelor’s degree. Those reporting credentials in the "other" category included holders of non-degree certificates in nonprofit management, certificates from various sources in other categories of management, certifications as facilitator/trainer, or other graduate degree programs. When asked their preferences regarding additional professional resources, the great majority of the respondents (79%) chose charitable-nonprofit management credentialing programs. The strong response for credentialing suggests that managers and leaders of nonprofit organizations understand and validate the value of nonprofit management certificate and master’s degree programs. The convergence of demands for more effectiveness and efficiency from nonprofit organizations, preferences for master’s degree holders, and the scarcity of senior managers of nonprofit organizations having formal management education, argue strongly in favor of including the acquisition of a graduate nonprofit management certificate and graduate degree in nonprofit management as important professional development goals and objectives. In short, yes, you should consider a graduate degree or certificate program for reasons that match your career and/or organization’s aspirations. Continuing your education can have a variety of effects on your personal and professional development, and what moves you make next in your career. 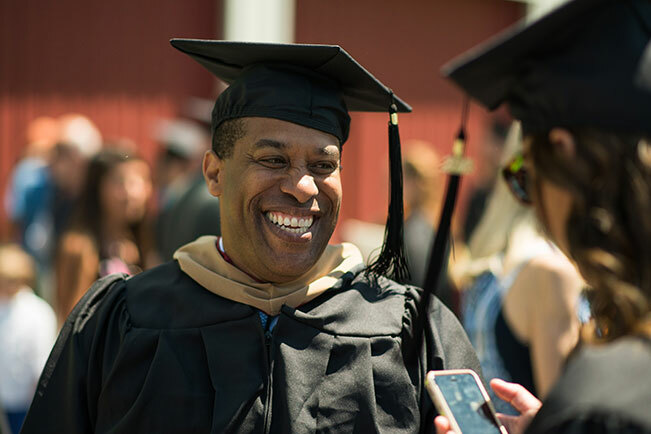 At Norwich University, we offer two pathways of furthering your education in the field of nonprofit management, both delivered online. Our Nonprofit Management certificates, encompassing four areas of study, could be the perfect addition to your knowledge, skills and abilities portfolio. Or maybe you are in need of a master’s degree credential to stay attuned to the industry or move up in your organization – the Master of Public Administration program begins with coursework tailored toward the foundations of public administration and then you can move on to a specific concentration in an area that interests you, including nonprofit management.